I grabbed a cup of hot bella coffee from the crowded Hatti Kaapi outlet outside the Bangalore airport terminal, and found a comfortable seat to perch myself. I had caught an early morning flight from Mangalore, and was to be joined by my friend Ganesh a.k.a the smiling buddha (SB), also the master planner behind this trip, and his friend Deepak—a young entrepreneur who’d given up his career in a large Investment bank to pursue opportunities in waste management. 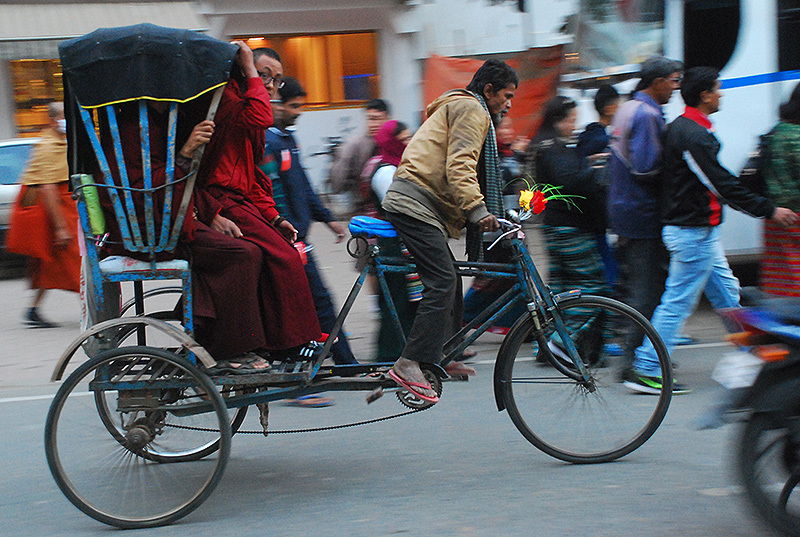 We were on our way to Bihar to experience what Bodh Gaya had to offer; and then to Varanasi by road and rail. Soon enough, I caught sight of SB; who instead of looking for me, was standing in line of some food outlet. Deepak joined us shortly after, and we were on our way. We would fly to Patna, take a train to Nalanda, go by bus to Bodh Gaya, take a train to Varanasi, and then fly back to Bangalore from Varanasi. We landed in Patna by late afternoon. Sorry to say this Bihar, but your airport needs some serious work. It reminded us of the very small Cochin airport, from some 15 years ago. A prepaid cab took us to Hotel Fort, where we’d booked a room. Thankfully the room we got was slightly bigger than the Patna airport, and so we could sleep well after a long flight. When in Rome, eat like the Romans. When in Bihar, eat Litti Chokha. SB educated us about Litti Chokha being the traditional dish of Bihar (knowledge he had gained Googling a few minutes earlier, I suspect). The name sounded interesting, and so we decided that would be our dinner. 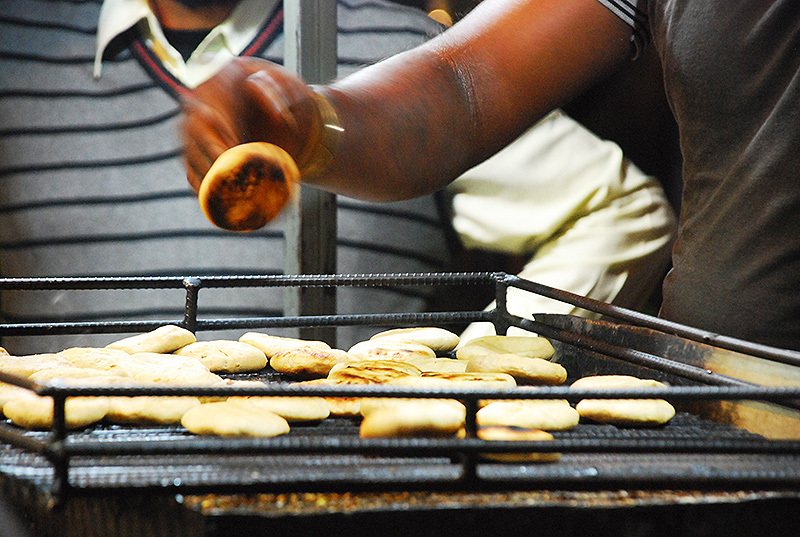 Soon we found ourselves enjoying some hot Littis from a street-side cart named ‘DK Litti Corner’. The owner apparently was a well-traveled man; for his cart featured photos of him in various parts of the world, sticking Littis into mouths of customers. An early-morning passenger train took us from Patna to Nalanda. 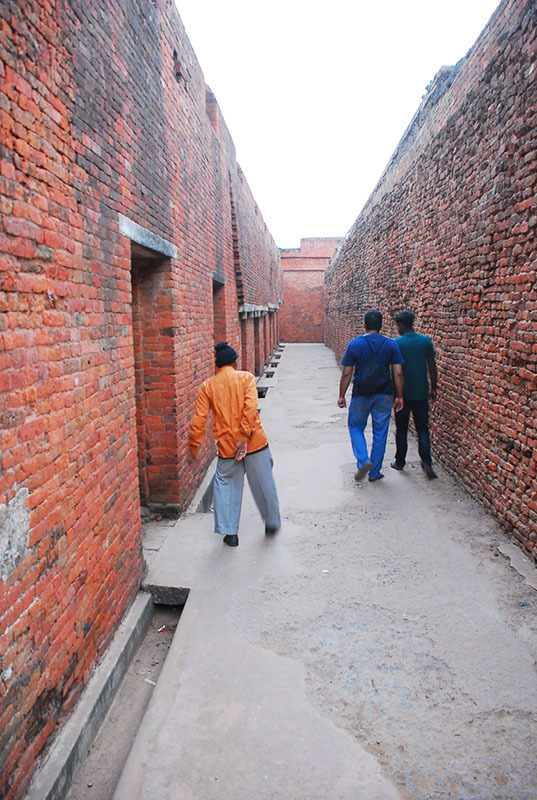 We checked into a Bates-motel sort of a Guest house located somewhere in Nalanda. Food there was arranged from nearby homes, and hence tasted fresh and great. For the next one hour, the food delivery ladies had the workout of their lives, running up and down fetching freshly prepared rotis and curries for 3 hungry gluttons while we kept emptying our plates, crying ‘more… more!’. 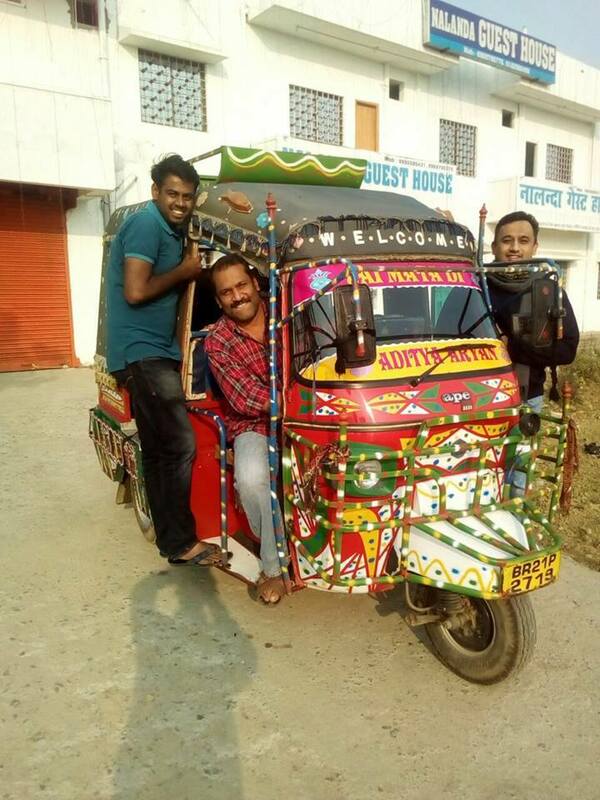 We then befriended an auto-wallah (one who drives the ornate auto pictured here) and made a deal with him to show us around. Pictured above: Deepak (Standing, left), me in the driver’s seat, and SB. 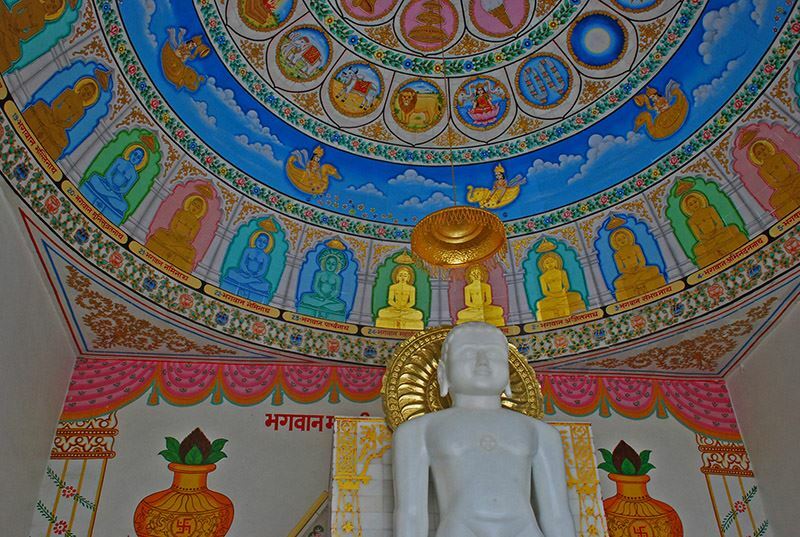 Birthplace of Lord Mahaveer, sacred for the Jains. We also went on to visit the ‘Black Buddha’ temple before heading back to the hotel. The isolated guest house we had checked into looked a bit eerie in the dark. The night was cold and still. Strains of hindi songs playing somewhere nearby and the trucks passing by through the highway comforted us with assurance that help was nearby in case a knife-wielding psycho barged into our dimly lit room. Around midnight, the explorer in SB awoke as another brainwave struck him! “Why dont we walk down and get a paan? Paans must be good here”, he said. So off we went, into the cold of night, in search of paan. Careful not to get run down by passing trucks, we trudged along the side of the highway and soon came upon a paan shop. And so we had paan that night. Oh, and how good was it? Meh. Our wish to eat a great paan would only get fulfilled later in Varanasi. 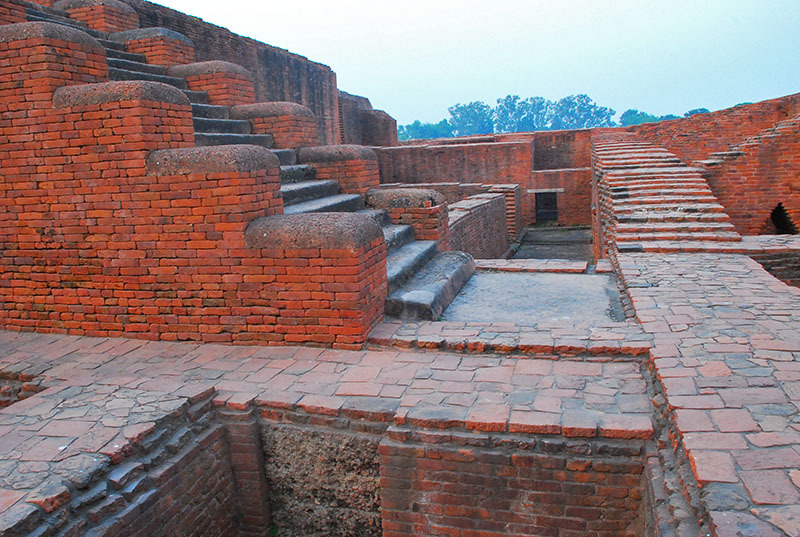 Pictured above: The world famous ruins of Nalanda University. 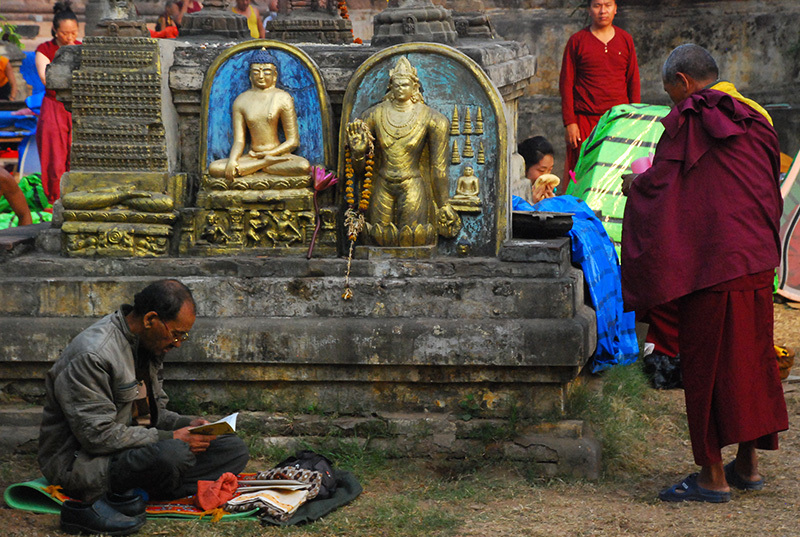 An old guide forced his guidance services upon us as we entered the ruins of Nalanda. I should say, his dedication to his job was unpralleled. To ensure he gave maximum customer satisfaction, he spewed out stories, philosophy and his own interpretation of the benefits of vipassana meditation to his ensnared listeners. But his stories were indeed intriguing, and transported us to an era when India was a coveted place for studies. Pictured above: The overzealous guide trying to catch up with his fleeing listeners. 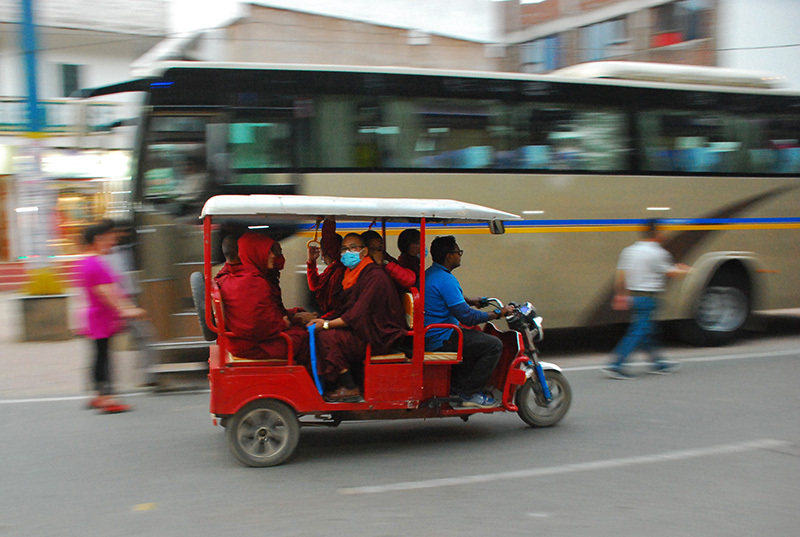 The following morning, we took a bus from Nalanda to Bodh Gaya. The bus ride was interesting, for, just like the train ride, it gave us a glimpse of the countrysides of Bihar – the fields, cattle, and the life of villagers. 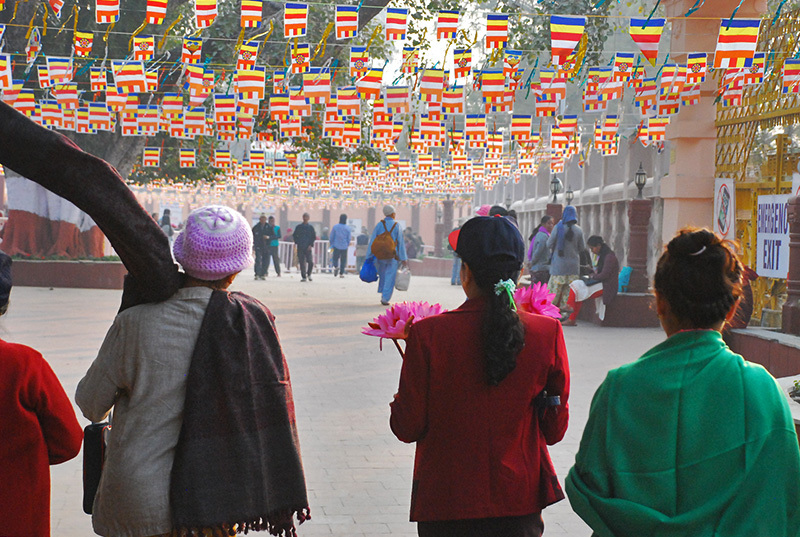 We checked into Hotel Lumbini International–a fine old, cozy hotel located centrally in Bodh Gaya. 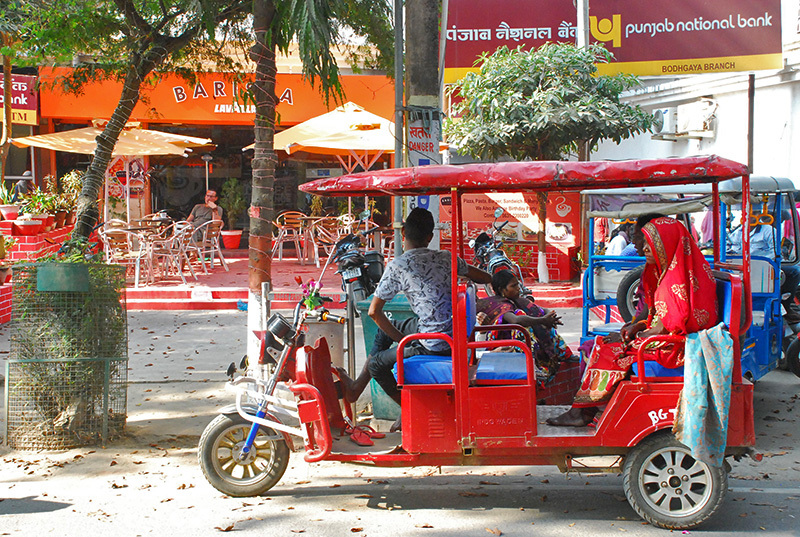 A little later, we got out to explore the streets of Bodh Gaya. A wrong turn took us into an alley of colourful houses. 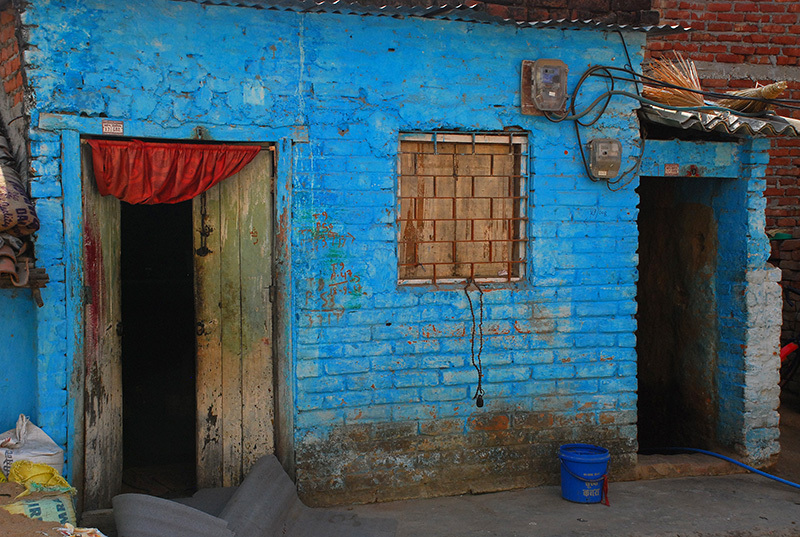 Pictured above: a colourful house in Bodh Gaya. 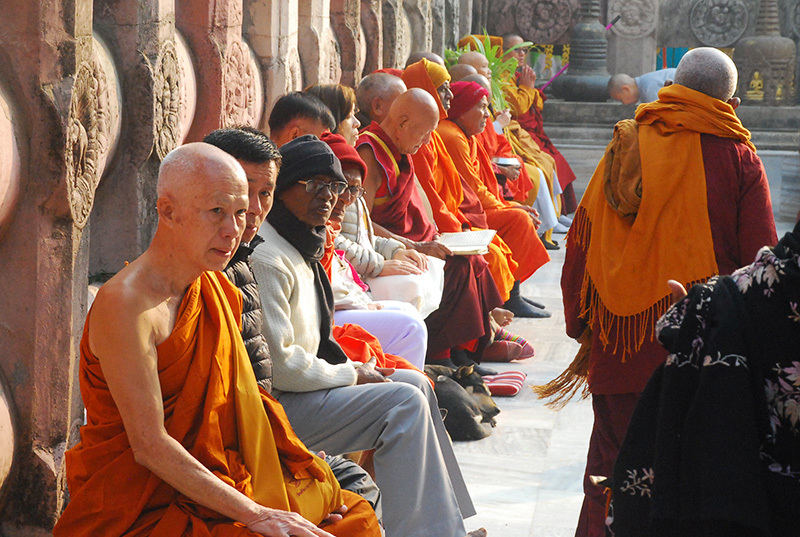 There are many monasteries set up by Buddhist communities from various countries . The Thai monastery was the best of the lot. 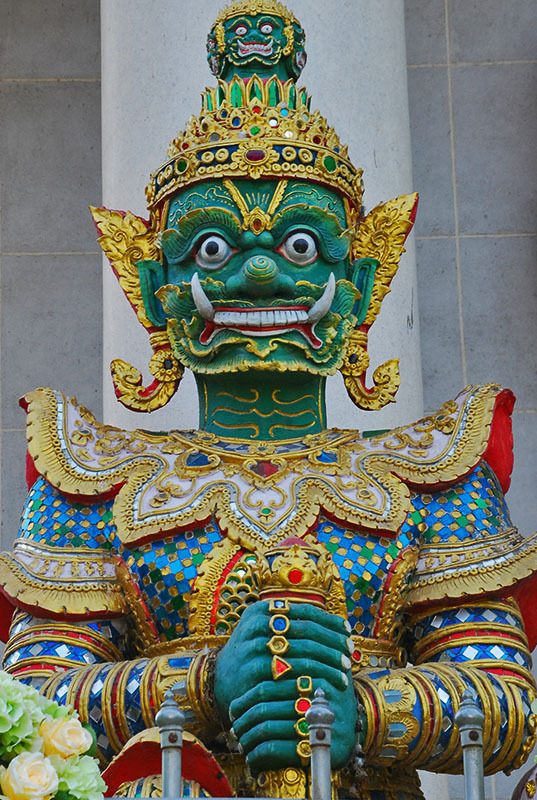 Pictured above: A guardian statue in front of the Thai monastery. 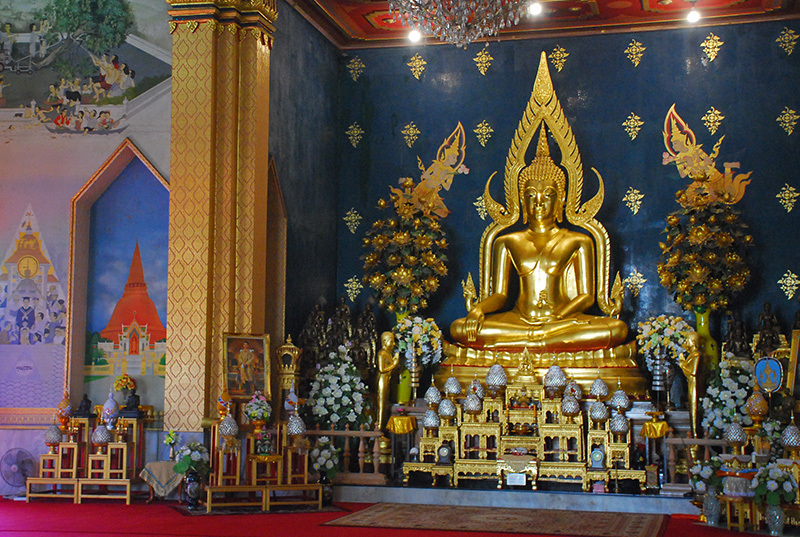 Pictured above: The Buddha statue inside the Thai monastery. 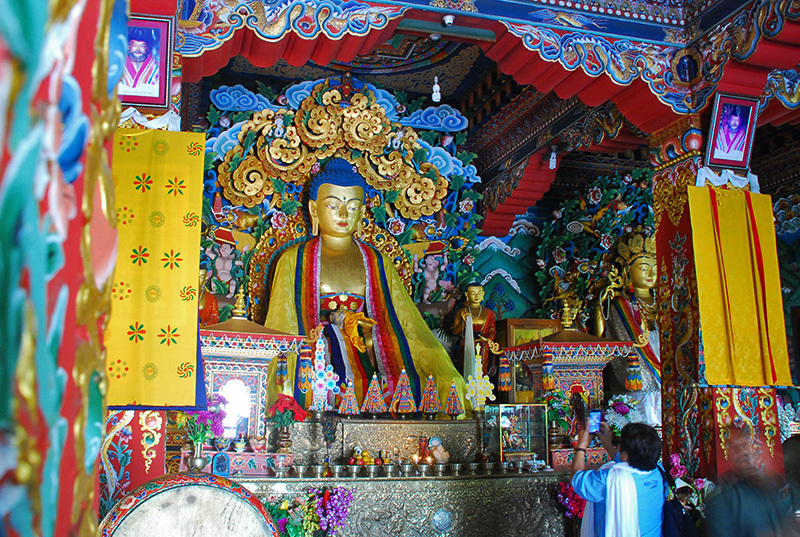 Buddha statue from the Tibetan monastery. The weather was pleasant, and so we decided to explore the city on foot. 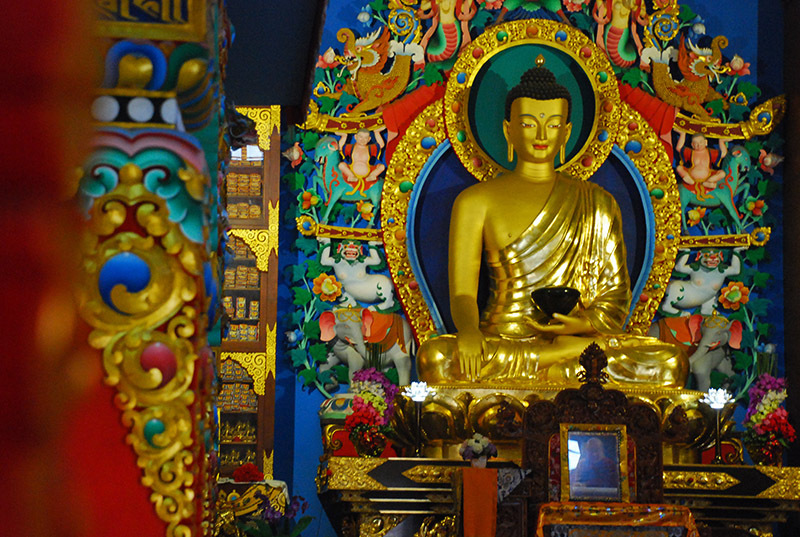 Pictured above: Buddha statue inside the Royal Bhutan temple. 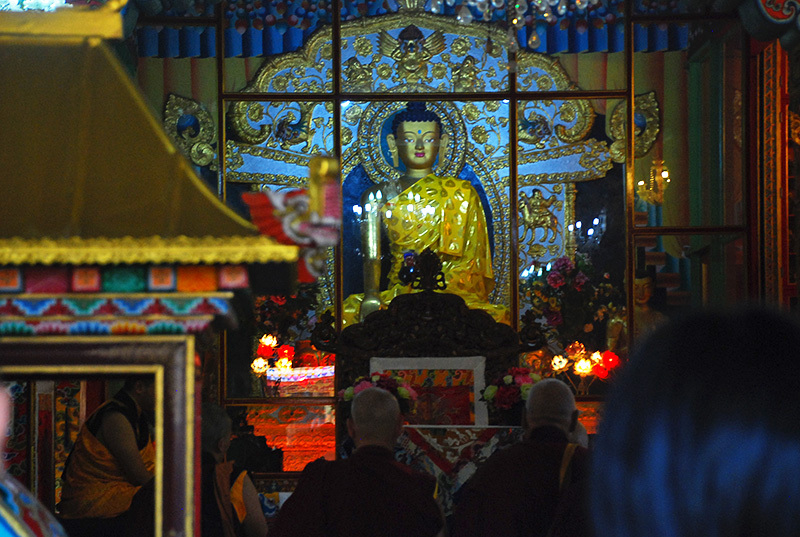 Pictured above: Buddha statue inside Tergar monastery. The Tergar temple had an Italian bakery set up inside its compound. 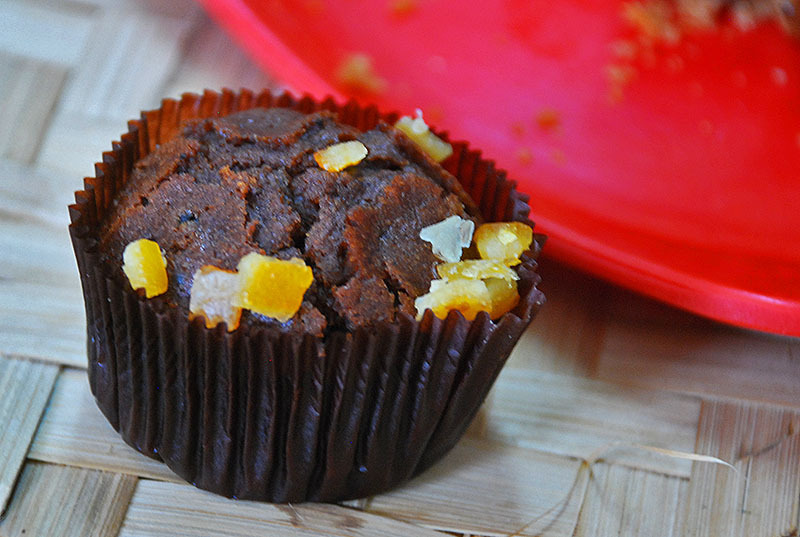 Cakes, Muffins and some coffee from there refreshed us. 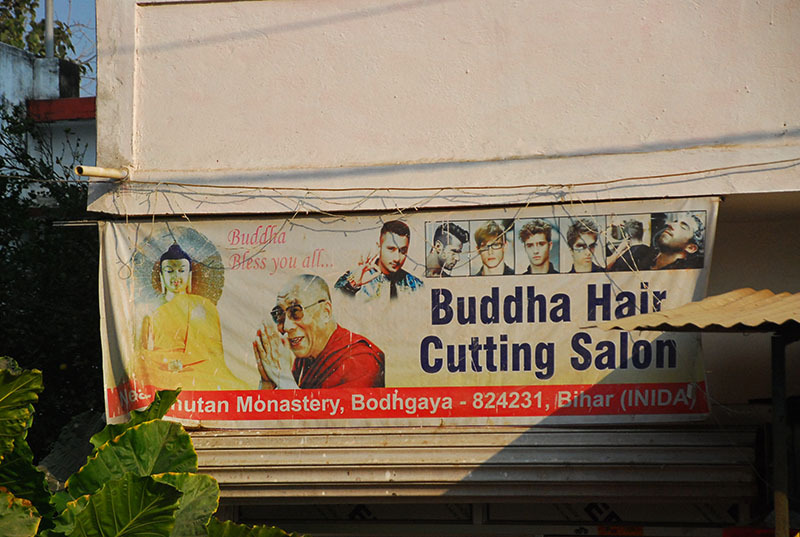 Bodh Gaya: Where the Dalai Lama’s hair style is in vogue. It was shopping time. 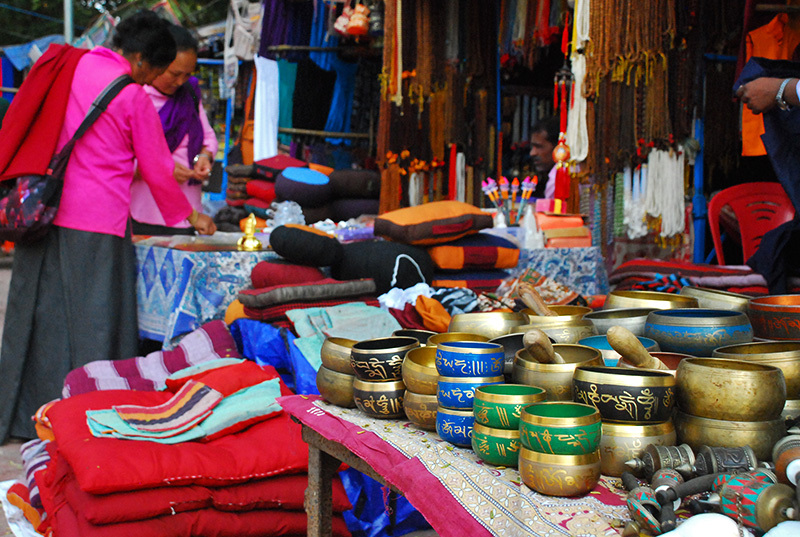 The streets are lined with shops selling prayer wheels, beads and Buddha statues. 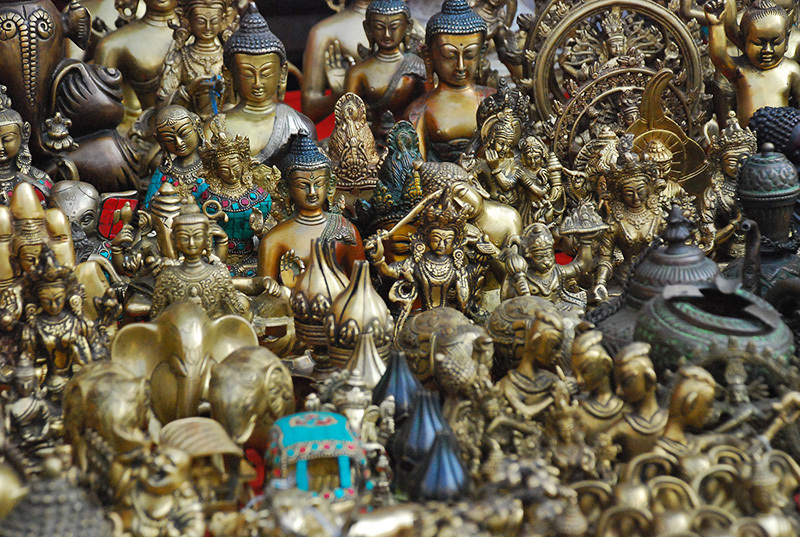 Bronze statues for sale in street-side shops in Bodh Gaya. 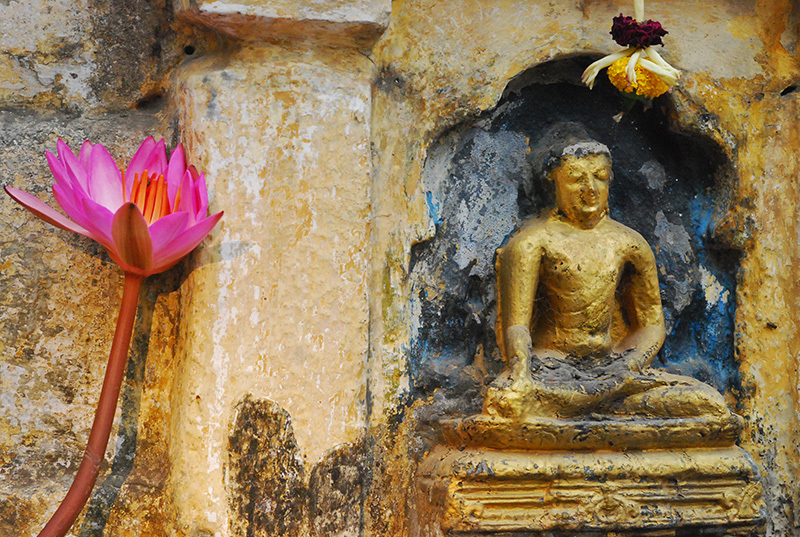 Buddha statue in Metta Buddharam Temple. 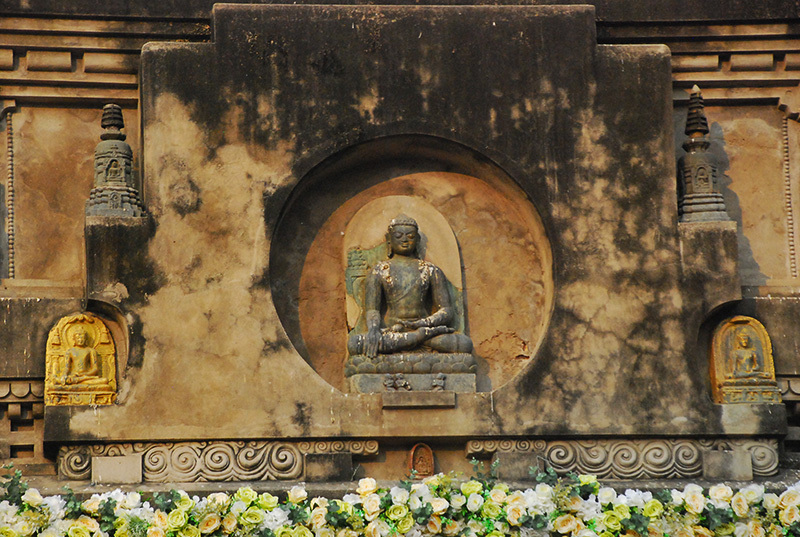 Pictured above: Entrance to the Maha Bodhi temple. 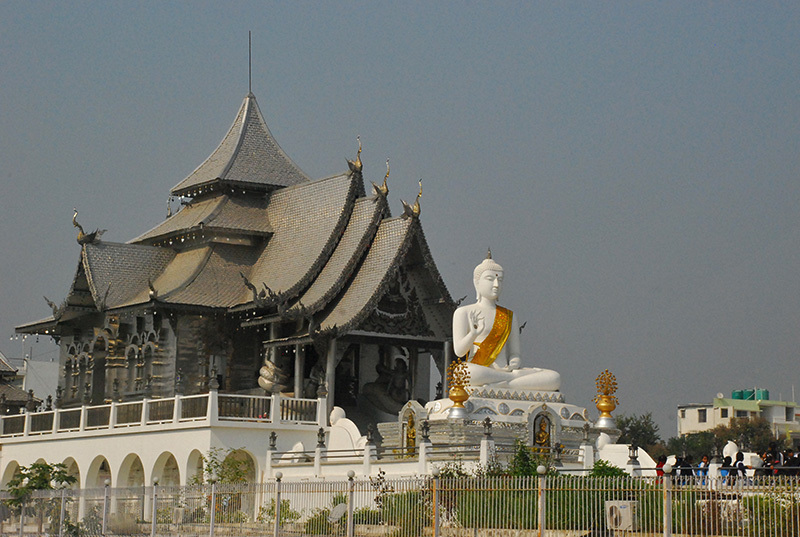 The Maha Bodhi temple. This picture does not do justice to the grandeur of the temple. A queue had already formed to visit the inside of the temple. 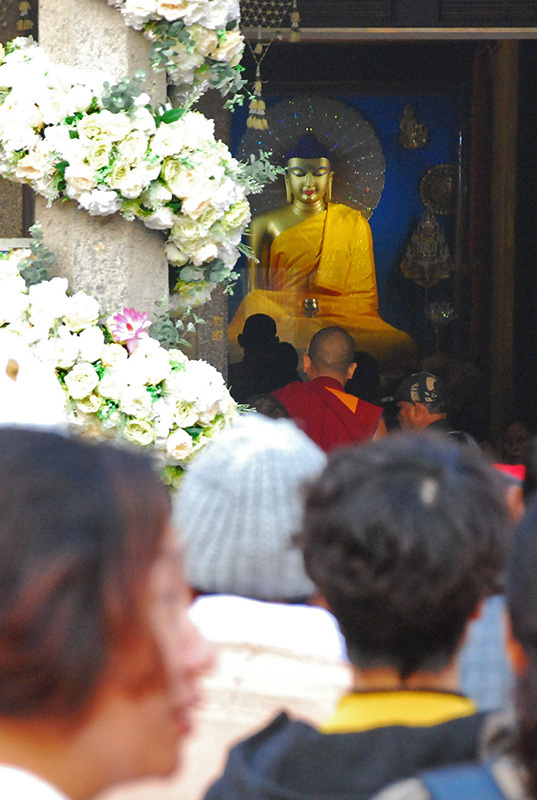 Since I wasn’t feeling comfortable taking photos of the Buddha, I sneaked this one and set my camera aside. The sides of the temple had carvings all around. As pictured here. A shot of another Buddha carving. 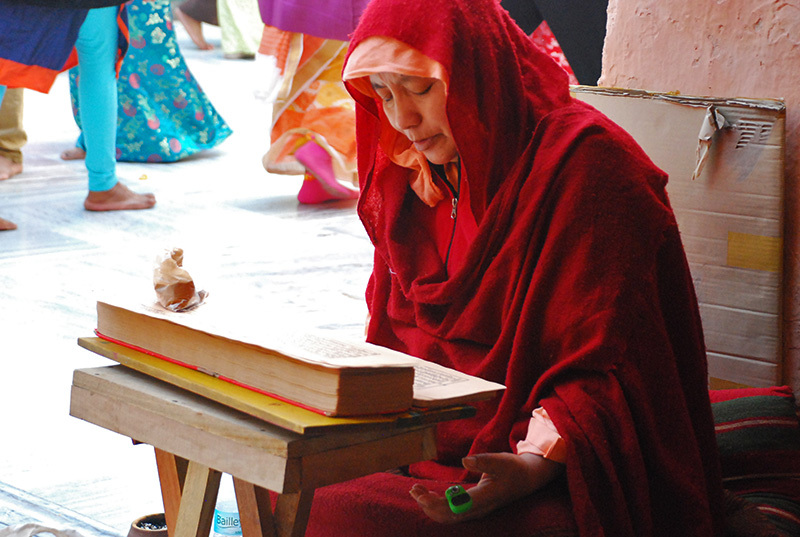 We saw devotees engaged in prayers all around the temple. 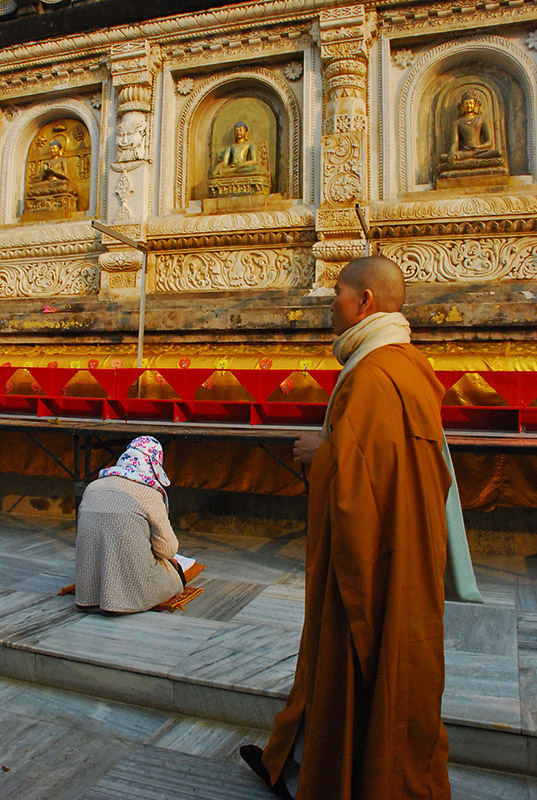 Like her–she was swaying and chanting prayers without moving from her position for long. 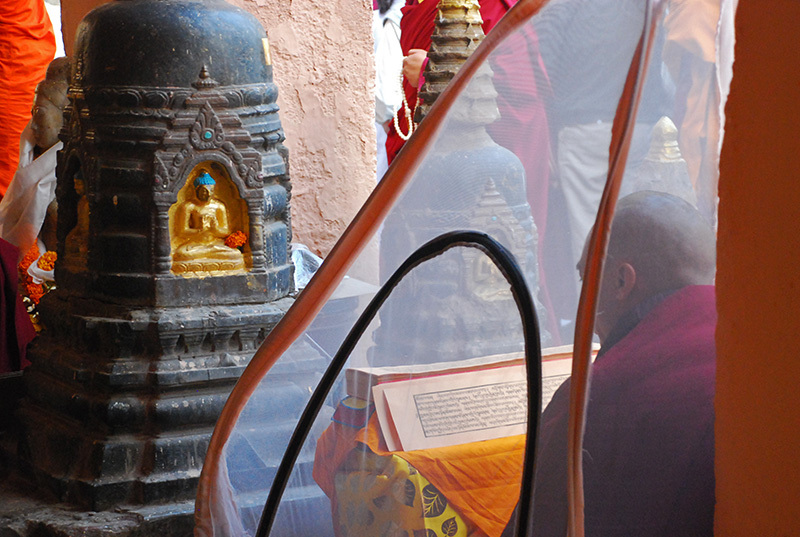 Here’s another devotee praying from inside a tent–seated so to keep the mosquitoes at bay. 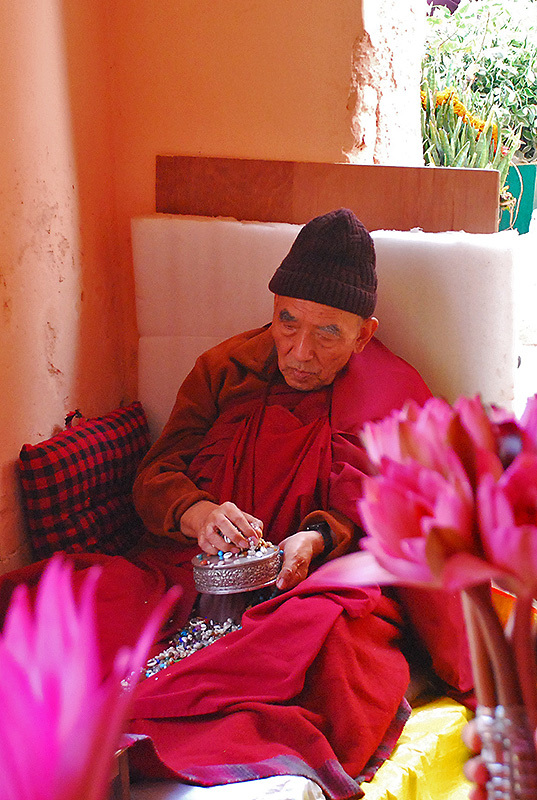 This devotee was praying while emptying and refilling a container with beads. This shot was from one of the sides of the temple. This person found a spot outside the main temple. We walked around the temple a few times. 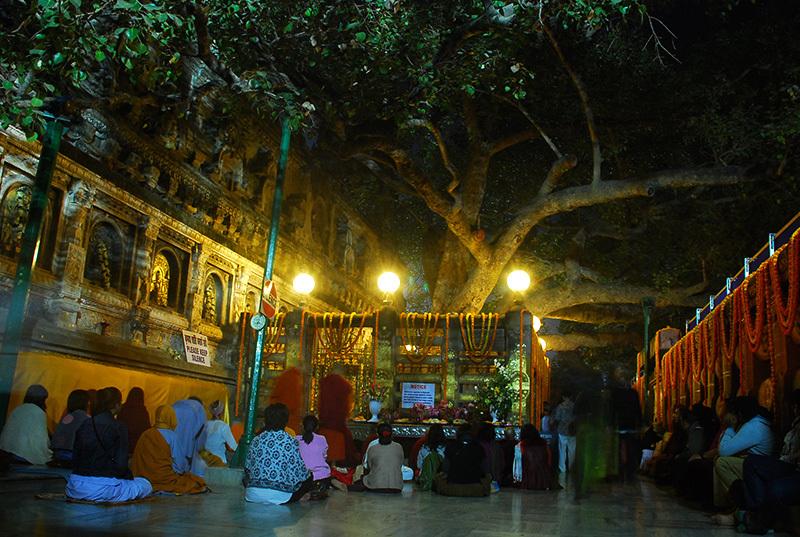 The Maha Bodhi tree. This is the tree under which Lord Buddha got enlightenment. 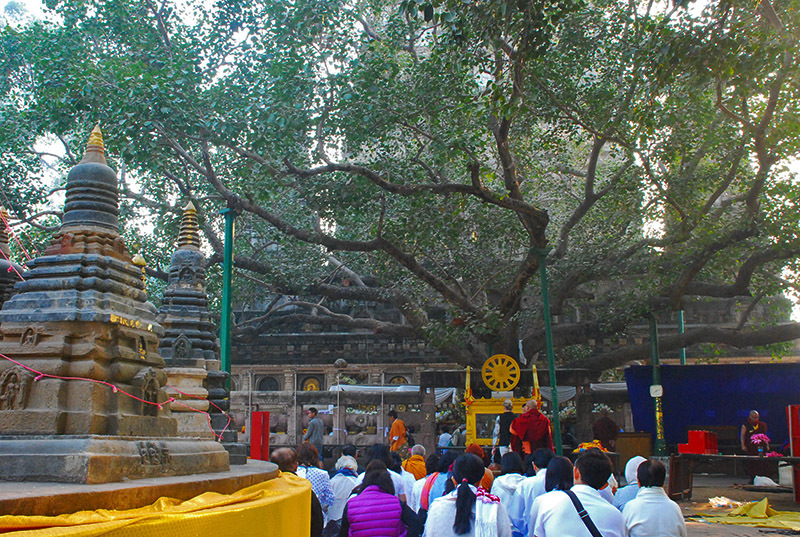 Another shot of the Maha Bodhi tree. I am always uncomfortable photographing people, since I am not sure what their reaction would be. So I either do it from a distance, without calling attention to myself, or like I did here, ask for permission before shooting (in which case the photo turns out ‘posed’). This sadhu did a good job here as a model. When I requested him for a photo, he cleaned himself up a bit, brushed his beard and gave me an intense look. 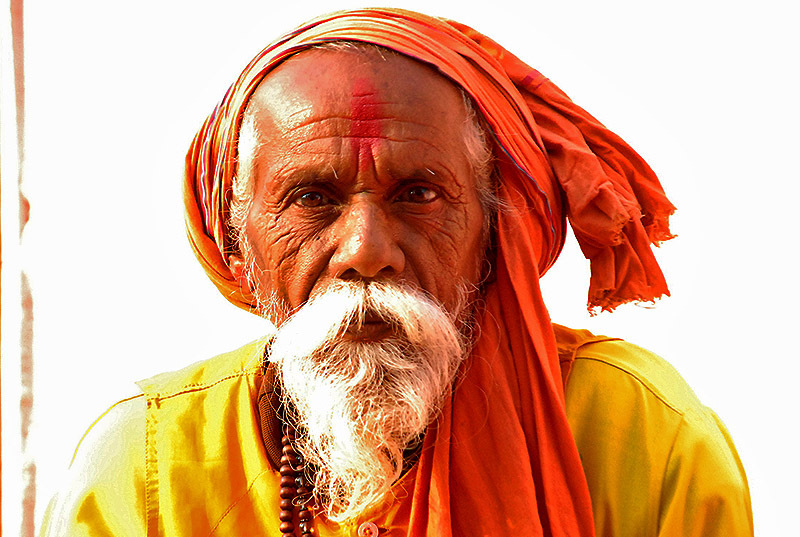 I gave him fifty rupees as alms–hope I get some karma points. 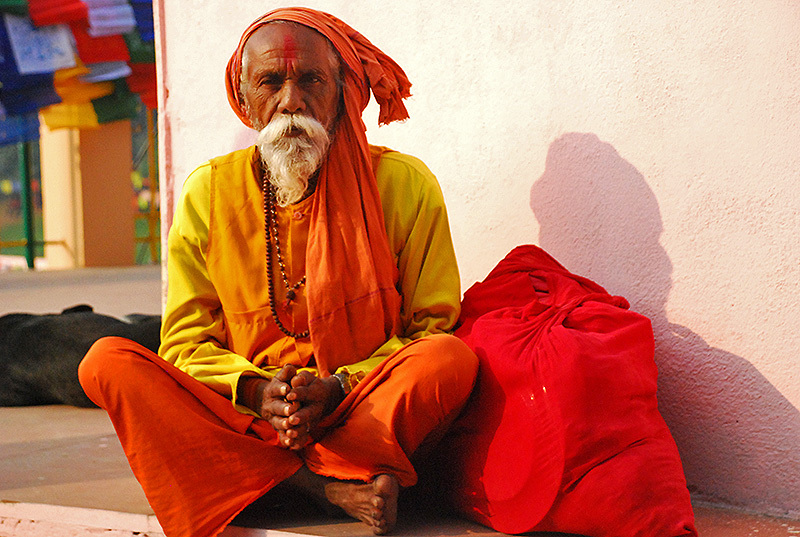 Another shot of the sadhu. This is definitely the slot machine of the monks. 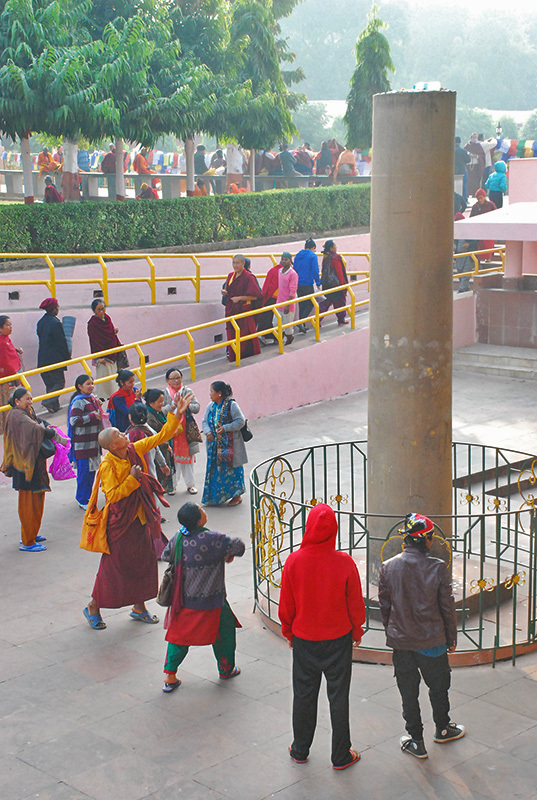 Myth is that if you manage to land a coin on top of this Ashoka Pillar, your wish would be fulfilled. 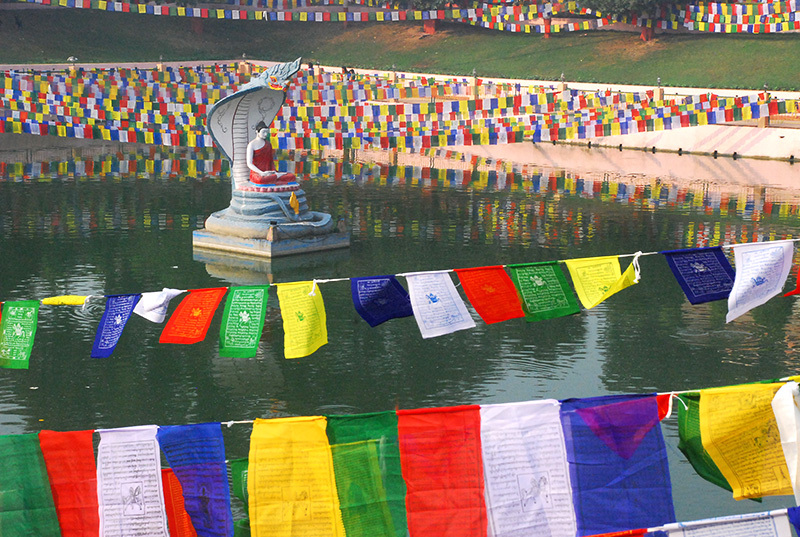 Muchalinda Lake: where Buddha was protected by a snake from a thunderstorm. 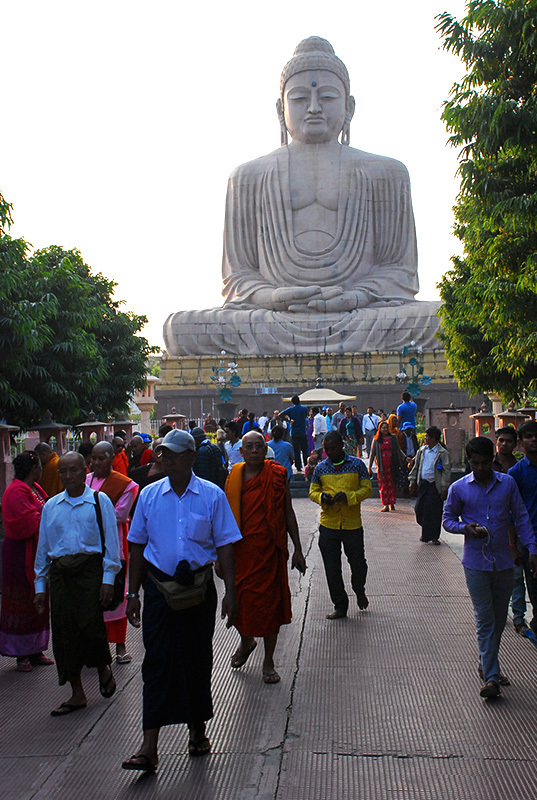 We spent about 3 days in Bodh Gaya. The night before we left, we went to the temple and sat around for some time. 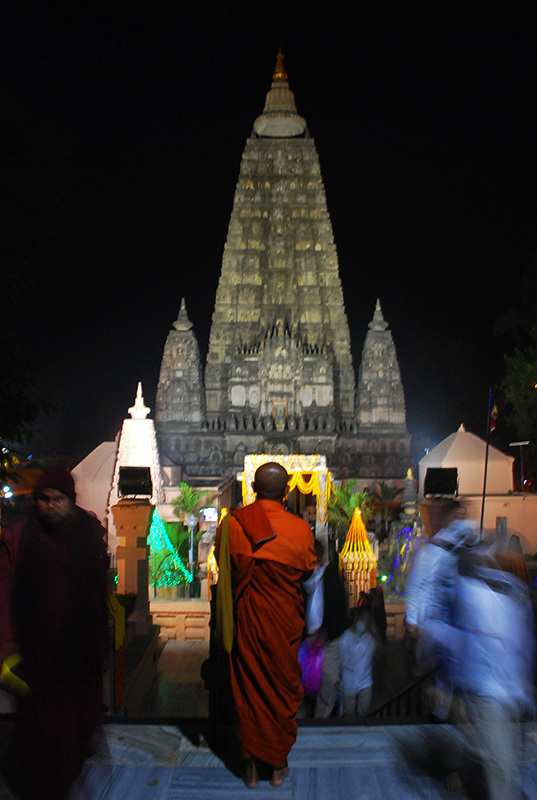 Bodh Gaya temple was beautiful at night. 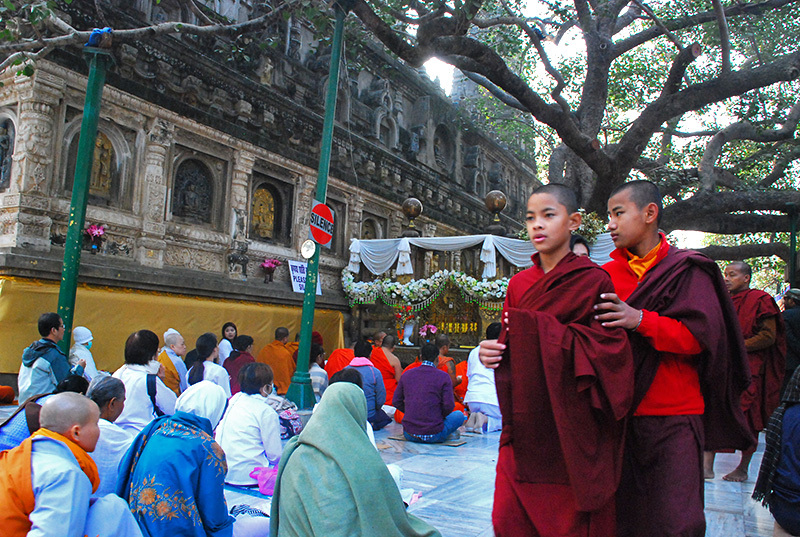 Sitting under the Bodhi tree was a peaceful experience–one that you’d want to experience more often. It was difficult to leave this place, but then we had to :(. 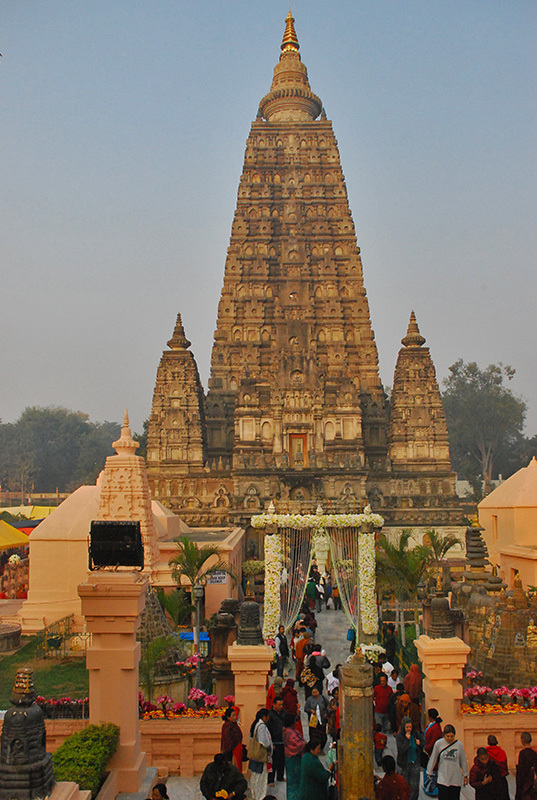 Have you been to Bodh Gaya? Tell me about your experience, will you?